If you want to spend your camping holiday surrounded by the beauty of nature then Jesolo Camping Village is the place for you. Situated close to the famous walking areas of Jesolo and with direct access to a golden sandy beach, this luxury camping site is also the perfect place to choose as a base for day trips to Venice or Verona. Book your holiday there through LuxCamp now and choose a mobile home with a beach view. Located close to the Venice Lagoon, this is the perfect place to relax between sightseeing trips. If you want to be more active, then try one of the many sporting activities that are available. 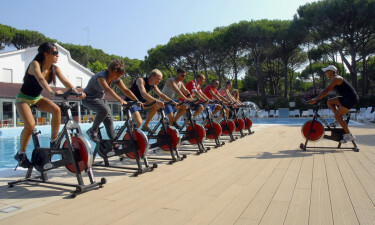 Why choose Jesolo Camping Village? The main pool varies in depth to suit all swimming standards. 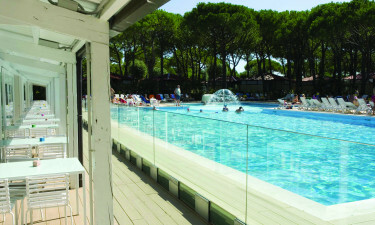 It is directly linked to the special children's pool and is surrounded by palm trees and a solarium. While staying at Jesolo Camping Village, you have direct access to the long sandy beach where you can either try one of the many watersports on offer or relax on a free sunbed.